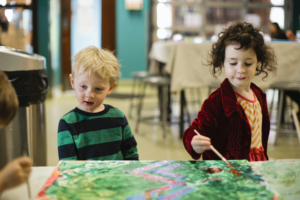 Children’s Museum of Tacoma (CMT) and Tacoma Art Museum (TAM) are collaborating to launch a new partnership that will provide dynamic—and free—arts engagement for families, connecting our youngest learners through the arts. Beginning January 25, 2017, up to 500 families each year can experience art at the two museums, receiving free entry to TAM after visiting CMT. The museums are neighbors, located less than a block apart along Pacific Avenue in Tacoma’s Museum District. Their proximity makes it easy for families to take advantage of the new program. Young children and their families will be introduced to works of art, various themes, and different creative processes through hands-on art activities in Becka’s Studio at CMT. These activities are inspired by select works of art on view at TAM. Families then receive a free Family Pass to visit TAM and experience these works of art in person. They can check out a Family Explorer Pack that will engage the whole family in the galleries. Visiting two museums in the same day may be more than some families can accommodate, so the TAM pass is good for one year. CMT proudly offers Pay as You Will Admission Wednesday–Sunday, allowing families to donate what is right for them. Click here to see TAM’s current admission rates. The new CMT-TAM partnership results in a savings of $15 – $40 per family at TAM. Explore activities inspired by exhibitions on view at TAM. Visitors to Becka’s Studio at CMT can engage in visual activities that help children’s social and emotional development through collaborating with others; improve fine motor and eye-hand coordination as they work with artist’s tools; and build basic awareness of design and composition. Parents can learn to connect with their children through art while supporting innovation and creativity with common materials. To ensure that parents and caregivers feel comfortable and confident visiting a fine art museum with young children, Family Explorer Packs are designed to guide families through fun, easy, and age-appropriate activities. Families can check out one or more packs based on materials found in current exhibitions. Each pack provides tips for looking at two works of art to find details, offers touchable materials to explore, and includes a related picture book to read together. Families are invited to explore at their own pace, and the packs are designed to be completed in 15 to 30 minutes, so as not to overwhelm new visitors. Click here for currently available Family Explorer Packs. This new initiative is supported by the Hoffman and Driscoll families in honor of their grandmother, mother, and wife, Susan F. Hoffman, who believed passionately in the arts and education.